Between machine learning and the limited space available for organic search, is it on its death spiral? Between machine learning, the limited space available for organic search, and the growth of both voice search and personal assistants, is it on its death spiral? The question you may be asking is why machine learning is part of this tale. After all, it’s there to adjust signals and help determine which signals to adjust for specific types of queries — not something that would kill SEO (as we know it). I could give some mamby-pamby answer like it will simply create an environment where the best, most engaging content will win and so SEO in the traditional sense will be unnecessary. However, I’m not a fan of answers that come in the form of, “I have a crystal ball and can see the future.” The reason machine learning is one of the core factors that will bring about the changes we have coming has nothing to do with that. The truth is, machine learning itself will have little to do directly with it BUT it will be necessary for the change in SEO to take place. If that sounds confusing, that’s because it is, but all will come to light shortly. As we’re discussing the third of the areas listed above, we’ll be able to connect the dots. What’s important to understand presently is: AI and machine learning combined with the ability to understand and interpret conversational language allows for information to be collected, understood, and presented to the searcher in very different ways. These ways vary by searcher, by device, and by subject. Basically, the limitations of constants in search result calculations are all but eliminated. Four Ads on Top: In February 2016, Google took out of testing their move to put four AdWords ads on top of the search results for commercial queries. This obviously pushed the organic rankings down the page. Number of Organic Rankings Drops From 10 to 8.5: According to Searchmetrics data released in October of 2016, the number of traditional organic search results dropped from 10 on both mobile and desktop to 8.5 on mobile and 8.59 on desktop. Local 3-Pack Includes Paid Listings: As Matt Southern reported right here on Search Engine Journal back in June, Google was spotted including a paid result along with two organic results in the local 3-pack. In August, a switch was made on mobile and a paid result was listed at the top of the local pack in the general results. More and More Carousels: Keeping his fingers on the pulse of things, Matt Southern has covered a lot of news around the ever-expanding carousels. 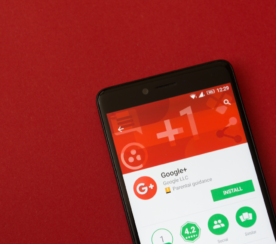 From the testing around the “shop the look” experience to the trending news and related stories both appearing in queries via the Google app, we’re seeing the ever-expanding integration of carousels on mobile. Now, one can reasonably argue that carousels are in large part organic results but here’s the thing — the organic ones tend to be publishers as opposed to retailers. So while space is still being taken by organic results, the results themselves will not satisfy a commercial intent. The searcher may head off to visit the site and read more about the Nintendo Switch or whatever their query is related to, but they’ll have to come back for the purchase giving Google another chance to get the AdWords click they’re looking for. I’m sure you can see the trend: Google is crafting the results layout in a way that minimizes the impact of organic results on commercially intent searchers. It further appears they’re even trying to distract searchers from their commercial intent when they’re passed the paid listing in the likely hope that they’ll return and click a paid ad after they’re done with an informational page. Additionally, they are pulling more of the shopping experience right into Google results pages. StatCounter revealed in a press release back in November of 2016 that mobile Internet usage had surpassed desktop for the first time. Those under 24 are 33% more likely to use voice search in public (51.6% will). 70% of people say they use voice search because it’s fast and less than 20% don’t use it. Another 70% of people (likely some serious overlap) use voice search to avoid typing. Over 60% of people want more results available via voice search and to avoid having to visit a web page. There are a lot of other interesting findings in the study but those above relate to what we’re talking about here. Voice search is becoming easier, more common, and more intuitive, and perhaps most importantly — more effective. As searchers find that their questions can be answered well with a voice search and arguably easier than typing (certainly for someone like me with fat thumbs and a tiny little Android keyboard), its use is destined to continue its climb. This is not to suggest it will replace keyboards altogether; there are environments where it’s socially unacceptable to speak your query but even that will change as it continues to gain in popularity and becomes more common. The biggest change I see on the horizon, however, comes in the form of personal assistants and the growth of voice-first devices. For those who don’t yet have one, voice-first devices like Google Home and Amazon Echo receive voice-based commands and provide audio responses. From telling you the weather or news to listening to music or even ordering a pizza, there is a ton of information and functions that can be served with simple voice requests. Can you see (or rather — not see) the problem here for SEOs? If we thought adding an AdWords result pushed organic further down the page and made position three that much less visible, imagine when there is no visible top ten at all. The expectation is that Google will excel at providing intelligent responses to questions as well as providing access to email, calendars, etc. while Amazon will win in the commerce space. Which one wins the overall battle for voice-first devices is yet to be seen, but interestingly, that almost doesn’t matter for how it’ll impact SEO as much as the battle going on to begin with. In reality, voice-first devices in this format are likely a bump on the road to where the technology is heading. I won’t pretend to be able to predict exactly how interaction between man and machine will evolve. However, I don’t believe it will be in the form of a cylindrical speaker occupying space that could be better used to house a bobblehead of Captain Kirk. What’s truly important about this growth, however, is the rapid adjustment to these devices and the personal assistant format of communication. Not coincidentally, Google announced their personal assistant being released on all phones running Android 6.0 and above, taking us beyond running simple queries on our phone and onto more complicated communications and interactions with other systems — all in a conversational manner. Once again, there is no top ten in this format. In fact, there isn’t even really a top one … there is simply a response. Now it’s time to tie this all together. 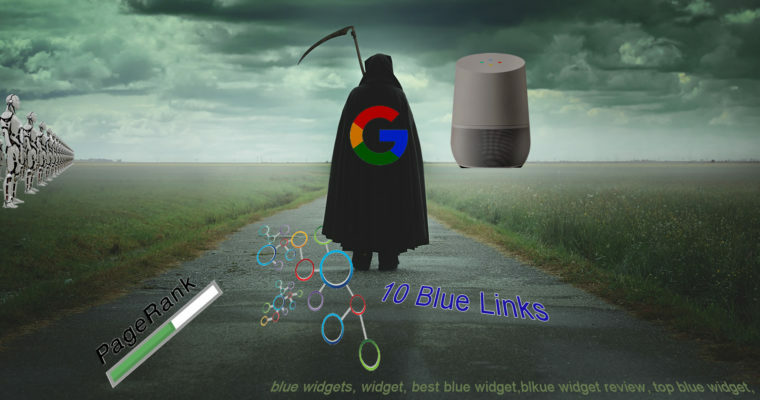 What do machine learning, limited organic space, and changes in voice search and devices have to do with the death of organic search (as we know it)? The Hummingbird algorithm added the ability for Google to understand conversational language. Machine learning allows Google to more quickly react to broad ranges of conditions including device, location, personal preferences, etc. All these things could be addressed without machine learning but never as effectively and never as quickly. Machine learning allows Google to more quickly learn how the real world functions and communicates. 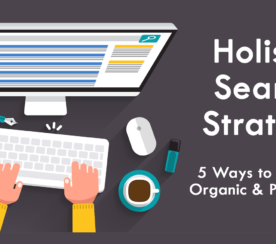 The space available for organic search results in the traditional desktop and mobile formats is shrinking and that which remains is being made less visible. Paid listings are occupying more of the prime locations in the search results. Google appears to be trying to distract searchers where a paid listing has not been selected for a query with articles and news as opposed to commercial results. 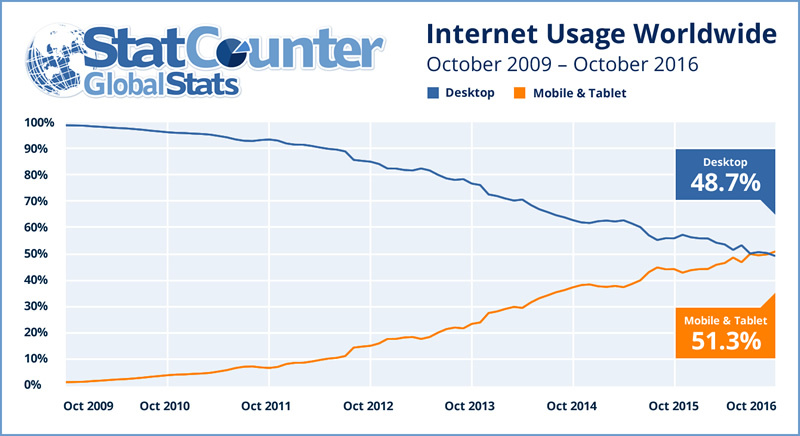 Mobile internet use has surpassed desktop and continues to climb. Voice search use is climbing quickly. 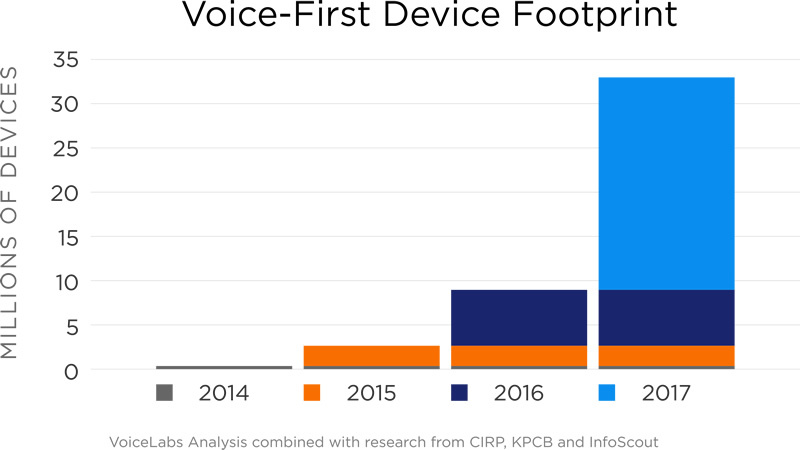 Voice-first devices look to more than triple their footprint in 2017. Personal assistants will be added to all modern Android devices. So, let’s summarize quickly what’s happening: Google is getting better and faster at understanding the data it encounters on the web and how the pieces of it all combine and relate to each other. Further, their understanding of conversational language is improving daily and is already excellent. Machine learning will aid them in making rapid and very personalized adjustments, in identifying which signals determine which information best suits the query and the user, and we end up in a scenario where Google will have a high confidence in the data they are providing. On top of this, we have continually marginalized organic space, and a move by users towards devices and solutions that involve no selection on their part of the information sent back to them as a result of their request. Is anyone left wondering why I believe we’re seeing the death of organic search (as we know it)? What’s extremely important to understand is that there are major changes coming not just in algorithms (that we’re all used to) but in the very way people interact with their devices. We need to assume that for many queries, we won’t have access to the users’ eyes and they may never end up at our site. Searcher: OK Google. Let’s shop for some shoes. Google Home: Would you like to shop for men’s or women’s shoes? Google Home: Where would you like to see them? Searcher: Cast them to my TV. Google Home: Men’s shoes displaying on your TV. Searcher: OK Google. Just show me the black ones. Google Home: Filter applied to just display black men’s shoes. Is there a type of shoe you are looking for? Searcher: Dress shoes for a wedding. Google Home: Filter applied to just display men’s black dress shoes. ould you like me to add the date of the wedding to your calendar? Searcher: Yes. It’s May 20th. Google Home : Wedding on May 20th added to calendar. Searcher: I like the black pair on the top right. Where is it available cheapest? Google Home: That pair is offered from 13 retailers and is cheapest at Steve Madden. They have free shipping on that order. Searcher: OK Google. Order that shoe in a size 11 to my house. This is a likely direction that queries will head. Voice-based search will almost certainly change the way we interact with our devices even for daily commercial searches. Display devices will certainly be necessary but there’s no reason they’ll be limited to computer monitors or mobile displays. The entire interface will be dedicated to only results and the results will likely be drawn from around the web with a high preference being given to those paying for that space. Q&A points: Google will always want to have answers to questions. 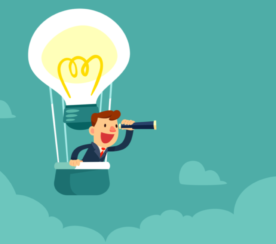 Providing content that answers questions or provides tips and information will get you found. Of course, the user may never actually see your site if they’re using voice search. However, some branding is better than being invisible. Commercial interactions: Of course, you’ll always want to get in front of people at the buy point (especially if you weren’t able to pitch them during the Q&A stage). Obviously, there’s the option to go in through AdWords but we’re talking about organic. Google won’t be able to go 100% paid so the road to commercial terms will be to truly be best in class. The battle will be fierce and the one with the best images, best reviews/reputation, best pricing, and best information will win. So, in the end, SEO is not dead but it’ll look nothing like it does now. The battleground won’t be for the top ten and in fact, for many queries, there may be no visual result. For others, the device may be highly variable and the result structure fluid based on what’s being displayed, the users receiving the information, and the environment or intent. You’re going to need content that will rank for Q&A and informational queries. The battle for the searchers’ eyes is going to change dramatically and the quality indicators will change with it. Providing the best possible product images, information, videos, guides, etc. will be what separates the results. There will likely be result sets closer to an image search result than a typical SERP now for e-commerce queries, and other query types will likely also change. Staying on top of these changes will be more critical than ever. We’re heading into a brave new world where the sites that win will be those that provide something that truly differentiates them from others and can be conveyed not just on multiple device screens but on devices without them. There’s a lot to do so this is a great time to stop reading this article and start thinking about how your site will be judged and what you can do to improve on it.